The date was the 4th of June 2011, we were camped at the Cabot Trail KOA campsite, waiting for our friends Silvia and Jörg to arrive from Switzerland. Silvia and Jörg's flight into Halifax had to return to Frankfurt (after almost reaching Halifax) with some mechanical problems, pretty scary. However they did arrive safe and sound eventually. During our wait we decided to go back to the town of Baddeck, it is a very picturesque little town. We walked the streets, enjoyed lunch and a coffee. Life is good! With full bellies we headed back to our campground, and were really looking forward to seeing our friends. They soon arrived with their rental motor-home, tiered but happy to be here. A bit jet lagged but looking good as usual. The morning of the 5th of June we headed for the Newfoundland and Labrador ferry in North Sydney. It is about a 5 hour ferry ride across if you go to Port aux Basque. About three times that long if you choose to sail to Argentia close to St.John's. We boarded the ferry in North Sidney and arrived in Channel-Port aux Basques about 7pm. The sea was a bit rolling, but not to bad. We are boarding.... wow this baby is big. Arriving on the Island of Newfoundland is not what we had pictured. It has a wonderful landscape that changes from lush green forests, to fjords, to sub alpine tundra.... it pretty well has it all. We drove 30 some km north from the ferry terminal and set up camp at Grand Codroy RV Camping. Very friendly staff and well laid out campground. We stayed here for one night. On the morning of the 6th of June, we sang "Happy Birthday" to Liz. She was duly impressed with my howling, luckily, Silvia and Jörg actually sang. 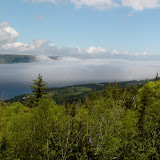 After breakfast we headed towards Gros Morne National Park, about a 3 hrs drive. We set up camp at Gros Morne - Point Norris KOA campground. Great campground and friendly people. After we had the camp set up, we went for a hike. We decided on a short 5 km hike along the ocean. It was great after sitting in the vehicles all that time. This hike goes along a protected area along the ocean over brooks and ponds and all kinds of fauna. Next blog will be about out trip from Gros Morne up towards St Anthony on the Northern tip of the Island of Newfoundland. For more pictures of the above blog, click the image below. The four of you look happy and energized after your long hike. I didn't realize there were so many historical sites with 'world heritage' designation. Canada just keeps getting better the more you see of it. I am so happy you are sharing this with us all.